Chikungunya is an infectious disease spread by aedes mosquitoes. This disease primarily causes symptoms of fever and joint pain. The infection can also cause headache, muscle pain, joint swelling, and rash. Most people will feel better after one week, however, in some cases people may have joint pain that lasts for months. The disease is spread when a mosquito bites an infected person, and later bites a healthy person. Outbreaks have occurred in Africa, Asia, Europe, and the Indian and Pacific Oceans. We have no cases of Chikungunya in Hawaii. There is no vaccine against Chikungunya. The best way to protect yourself is to practice proper mosquito control. 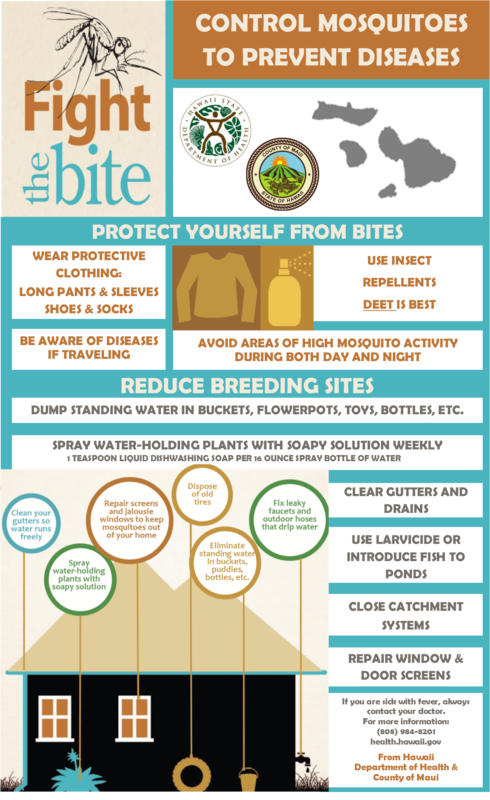 This 2 step process includes preventing mosquito bites, and reducing breeding sites. Click here for information on mosquito control. Visit http://www.cdc.gov/chikungunya/ for more information.